While Apple intends to show the versatility and power of its latest tablet, the commercial demonstrates what many in the tech industry already know, fewer people are sitting at desks with a tower and monitor combo. Laptops began outselling desktops a little over a decade ago, but tablets quickly took the lead. In 2013, tablets began outselling laptops, and the gap has continued to increase. What’s even more incredible is that mobile phone sales have outpaced toothbrush sales across the world. While tablets and other mobile devices are soaring in sales, the majority of online purchases are still made on desktop or laptop computers. In as late as the 3rd quarter of 2017, users spent more money using desktops over mobile. 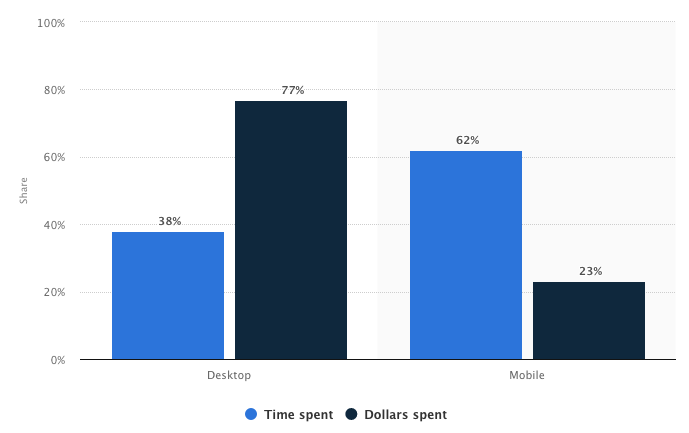 So while 62% of browsing time was on mobile, 77% of purchases were made on desktops. This may be partly because the people making purchases (those with debit and credit cards) are older generations and parents who are more comfortable with using a larger screen to complete transactions. Or is it because many online transaction experiences are designed for a desktop first, not mobile? Distribution of time spent on retail sites vs. dollars spent in the United States as of 3rd quarter 2017, by platform. The current consumer generations will continue to be a target market for many years to come, especially as Gen X, Y and Millennials move into the larger marketplace. If we can entice mobile users to become mobile customers while scrolling through Facebook or Instagram or even Twitter while killing time at the doctor’s office or sitting in traffic, mobile sales would increase and could outgrow current purchases in big numbers. What keeps people from making purchases on mobile devices? Users on mobile devices are typically window shopping. They’re “downloading” inspiration and building desire but usually don’t intend to make purchases. Social platforms have conditioned mobile users to scroll through with minimal engagement. They may click on a video, swipe through a gallery of pictures or read a short article, but the behavior is fleeting. Content influences yearning and craving, but the dopamine created is only sustained by continuous stimulation, so most users don’t linger long enough to make a purchase. Besides, most purchases aren’t made on social platforms unless your company uses Shopify. So how do you get more purchases on your mobile site? There are two options moving forward. Maintain efforts to keep vying for attention. Content creators analyze color, movement, and keyword effectiveness. Studying behavior and adjusting tactics will always be part of marketing, but they aren’t enough. “Standing out” on social media doesn’t create an immediate purchase. It just means a user might remember your product long enough to make the purchase later on their laptop. The answer isn’t on social media; it’s an extension of social media. Your site is where users complete a purchase, but they probably get there from a social platform. The experience should be a smooth transition. Like walking from a room full of tables with a plate of food on each to an identical room with the benefits of a chair and utensils at each table. In other words, make your websites look and operate much like social platforms but with the added functionality of completing a purchase. Your e-commerce site should be visually-driven. While content is still an important and useful marketing tool, content focused on a purchase page should be minimal. Convey as much information in photographs or graphics as possible. If you do need text, make sure it’s readable, both visually and in language style. Keep things simple. Your social platforms shouldn’t be an extension of your site—your site should be an extension of your social profiles. Finally, make purchases easier and quicker. Invest in technologies that allow auto-fill, or that connect to Paypal, Apple Pay, Venmo, and other apps that make purchasing more secure and easy for the user. The less information users have to enter in order to make a purchase, the more inclined they’ll be to follow through. One example is Amazon’s one-click purchase. If there are too many steps, customers will get impatient and want to return to their previously scheduled scrolling. Skip the membership drive. If someone is making a purchase for the first time on a mobile device, don’t make them create a user account. Payment apps keep track of all the transaction and shipping information. If a customer likes your store enough, they’ll come back to create an account later. Laptops and most definitely desktops are on the way out. They may not completely disappear, but for the consumer and online shopper, they’re becoming as obsolete as one of those manual credit card imprinters, or worse, paying with a handwritten check. So keep up with what the users want - a seamless stimulation to shopping experience so they can swipe on to their next purchase.